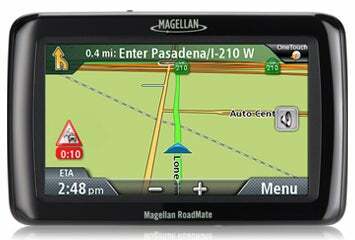 If you're looking for a good, basic 4.3-inch GPS device from Magellan, the RoadMate 2035 could be a good choice. With a list price of $160, the 2035 is the least expensive 4.3-inch navigator in Magellan's current lineup. Like all of the RoadMate models, the 2035 features lifetime subscription-free, advertising-supported live traffic alerts. But its omissions might have you looking elsewhere. Compared with other models in the RoadMate 2000 line, the 2035 is a stripped-down version of products that have list prices of only a few bucks more. While the core navigation features are identical to what you find across the RoadMate line, expect to give up some conveniences as a tradeoff for buying this entry-level model. First, the included map set consists of only the 48 contiguous states, plus Alaska, Hawaii, and Puerto Rico. Canadian maps are not included. Also missing is the AAA TourBook as well as the highway lane-assist feature. While the TourBook is nice to have, it's not critical, unless you're the sort who plans lots of weekend getaways. But I wouldn't suggest purchasing a GPS device that doesn't have some type of a highway lane-guidance feature. For highways with complicated interchanges, lane guidance gives you the extra confidence and advance notice to get into the correct lane well in advance of a maneuver. Nor, as you might suspect, is a Bluetooth phone interface included. Those omissions aside, the RoadMate 2035 has most of the features unique to more expensive RoadMates. It has text-to-speech; and like all Magellan products, it offers excellent POI search capabilities. Also included is Magellan's One Touch interface that lets you easily navigate to a favorite location or a saved search such as "the nearest Starbucks". The highway-exit POI feature helps you find gas stations, hotels, and restaurants at upcoming exits. Finally, the unit has multisegment routing with route optimization, a feature frequently left out of entry-level models. With the exception of the highway lane-assist feature, the actual driving experience using the 2035 is identical to other RoadMate products including the RoadMate 5045. Since it uses the same Navteq map data and routing algorithms, the routes generated were identical to those on the more expensive RoadMates. When looking for a GPS, it's all about the features you want and the price you're willing to pay. If the 2035 hits a rock-bottom price, it may be worth considerating. But if it stays at about $10 less than the RoadMate 2036, which has all of the features of the 2035, but includes maps for Canada, highway lane-assist, and the AAA TourBook—I'd recommend springing for the 2036 instead.